You don't like hybrids you say. You miss the sound of the V10s you tell me. Get over it. Because here ladies and gentleman we have the best thing to happen to the performance engine since the V8. Everyone who has a passing interest in forced induction knows superchargers and turbochargers both have significant advantages and drawbacks. Superchargers are driven directly via engine torque and thus offer N/A like throttle response and torque curves (the good ones anyway. ) However, crank torque is precious and using it to power your intake compressor is like using your 401k funds to fund a lucrative investment. Sure, it might work, but you got hit with a huge withdrawal fee on the way out. 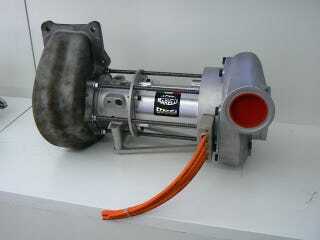 Turbochargers on the other hand harvest waste heat energy from the exhaust. There's some price in efficiency plugging up the exhaust like that, but the net effect is overwhelmingly positive. The downside is you need exhaust energy to drive the turbine and thus create more exhaust energy - which results in lag. Meet the e-turbo. Turbos spend a lot of time dumping excess exhaust overboard to stop from overboosting the engine. Rather than use the wastegate (valve that bypasses the turbo) to do this these turbos turn the bearing section into a generator that harvests this energy and stores it for later use (by holding the shaft RPM constant and absorbing the excess energy trying to spin the turbine faster.) This may or may not be combined with a traditional hybrid vehicle drive system. What gets exciting is when you reverse the flow. Put your foot down at 1500RPM with one of these and rather than waiting for the whole system to work itself up to a high enough exhaust energy to spool the turbo and develop power - the generator reverses roles and spools the compressor. Your turbocharger briefly turns into an electronic supercharger. This rapidly increases exhaust energy/mass flow and after a second or two exhaust power takes over and the motor becomes a generator again. Net result? Turbocharger power and efficiency with 0 lag and fuel economy savings. Combine this system with a hybrid drive and prolonged high power operation can harvest serious waste energy from the exhaust that would otherwise be dumped overboard by waste gate and store it in the hybrid system for use as actual wheel torque. This is exciting stuff as this is exactly where most hybrid systems fall flat on their face - during cruise. The ability to actively capture this exhaust heat energy even during steady state operation is a huge boon both on the performance and the efficency fronts. This is the 21st century version of turbo-compounding and turbo-supercharging all rolled into one. More power, N/A like throttle response, better fuel efficiency. Heat-energy recovery turbocharger hybrids are pretty much the most exciting technology that we could see in road cars to come out of F1 in as long as I can remember. You want this thing.